The Water Zone is focused on the pool area, poolside and spa areas. These products including water jets, cascades, massage systems and air jets help to create a poolside area for relaxing and rejuvenating. All these features have cutting edge design and a functionality and elegance that our end users should expect. Water jet for pool surround, featuring swans-neck shaped cylindrical section, providing a high-pressure jet of water for a relaxing massage. 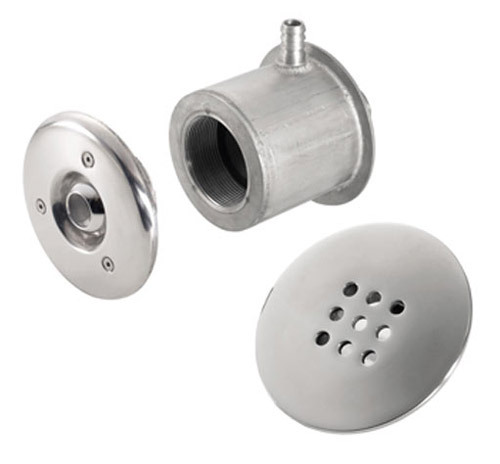 This accessory is made from polished AISI -316 stainless steel and has to be ordered with the anchor plate for secure installation. Features 4 interchangeable nozzles: uniform, double, diffuser and fan spray nozzles. 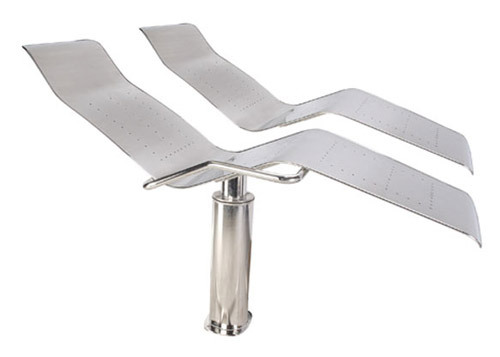 Wall-mounted water jet featuring cylindrical cross-section, Designed to produce multiple high-pressure water jets for a back and shoulder massage of medium intensity, depending on model. 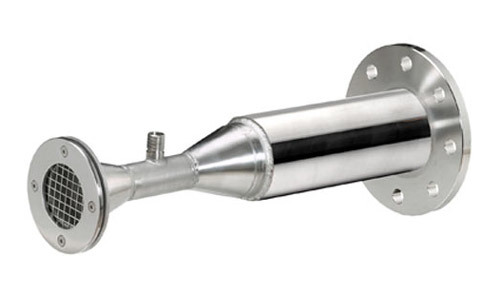 This accessory is manufactured from polished AISI-316 stainless steel. 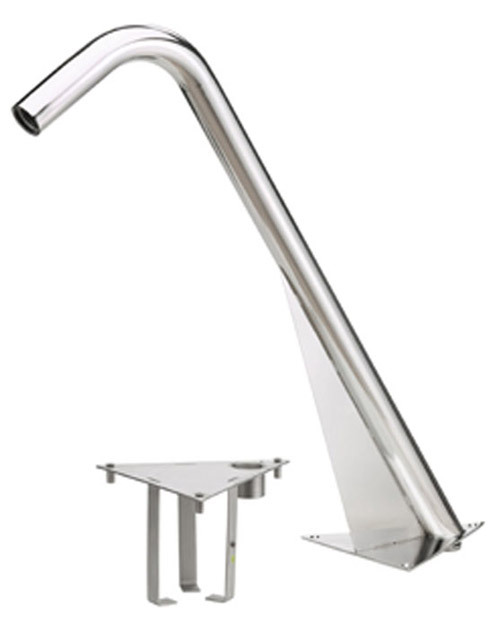 Comprised of a set of water jet nozzles in mirror-polish stainless steel which, when situated and directed correctly, provide a flow of water using recycled pool water. Creates water currents of varying strengths. Hydromassage jet system, specifically designed to be situated in areas where there are benches, water channels etc. Wherever an intense, localised massage is required. The acceleration of the water jet resulting from the venturi effect creates hundreds of thousands of tiny air bubbles which further intensify the massage effect. 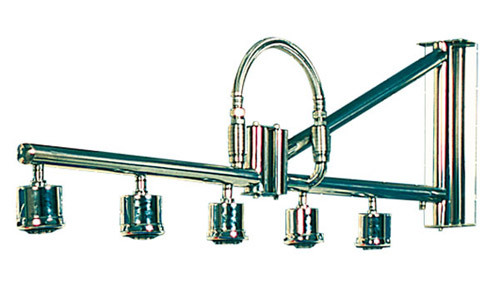 This accessory is 100% mirror-polish AISI-316 stainless steel with interchangeable nozzles. A wall-mounted cascade designed to create an intense yet deeply relaxing curtain of water. Manufactured from mirror-polished AISI 316 stainless steel, featuring rectangular cross-sectioned deposit with built-in filter which stabilises water flow and ensures a visibly uniform curtain of water. The length of this water curtain can vary between 600 and 3000 mm. This accessory is 100% mirror-polish AISI-316 stainless steel. A cascade for the pool surround designed to create an intense yet deeply relaxing curtain of water. 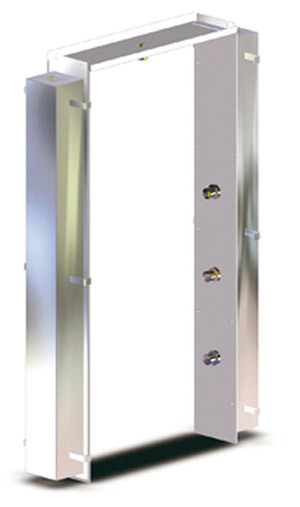 This accessory is made from mirror-polished AISI 316 stainless steel and has to be ordered with the anchor plate for secure installation. A front-on cascade designed to create a moderate flow curtain which appears to slide down a glass surface. Water curtain length: 2000 mm. 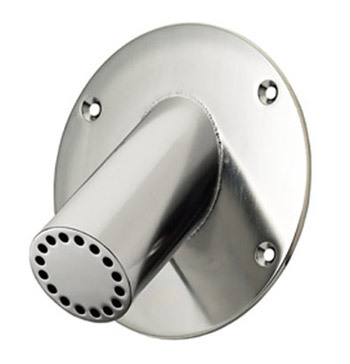 This accessory is manufactured from mirror-polished stainless steel, comprising a circular cross-sectioned water supply and a pointed metal sheet which directs the water onto the vertical glass surface. Set comprising three massage effect nozzles, using a combination of water and air to stimulate calves, thighs and hips. These are hung in a vertical arrangement on the wall of the pool, at a height of 30, 60 and 90 cm. from the pool bottom. Pool floor massage effect air bubble generator. Cylindrical polished stainless steel accessory to be installed in pool floors. Available in the following diameters: 300 mm, 300x300 mm, 550x500 mm, 675x675 mm and 750x750 mm. Elongated pool floor massage effect air bubble generator. The casing is made from polished stainless steel in the form of a long snake, to be installed in pool floors. The steel sheeting has holes along its length to allow the bubble to escape and create the desired effect. Elongated massage effect air bubble generator for pool floor and/or bench for feet and buttocks. 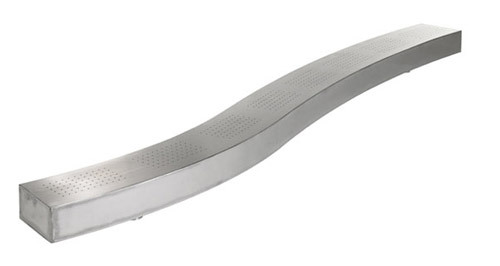 Polished AISI 316 rectangular or semi-circular stainless steel casing accessory for mounting on pool bottoms or benches. The steel sheeting has holes along its length to allow the bubble to escape and create the desired effect. Ergonomically designed massage accessory with air jets in the back, lumbar and leg regions. The bed is comprised of stainless steel casing with air holes situated in the key massage areas. The range includes both a single and double model. Manufactured in AISI-316 stainless steel and ergonomically designed to provide maximum comfort. The system is based on air which is injected through the base of the lounger, providing a muscle-relaxing massage. Ergonomically designed massage accessory with air-water jets in the back, lumbar and leg regions. The bed is comprised of an AISI-316 stainless steel casing with air holes situated in the key massage areas. The massage bed system also features semi-circular hand grips and headrests in both stainless steel and Iroko wood. 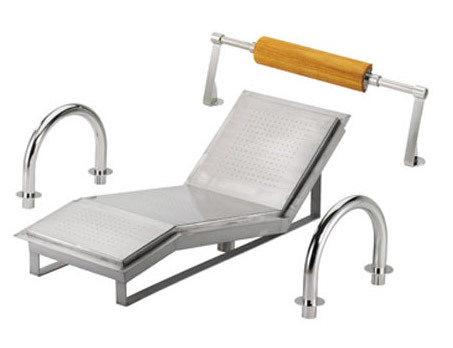 A surround system water lounger that combines shower and relaxation effects. It is made up of an ergonomic stainless steel recliner, four triangular columns, each holding two lateral shower heads whith air aimed at specific points on the body, as well as three overhead shower units which complete the relaxing water surround effect. 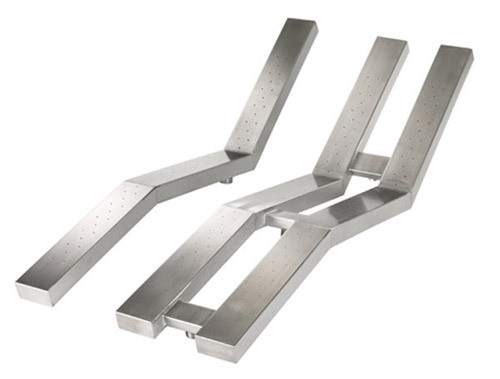 An attractive element manufactured in AISI-316 stainless steel, comprised of a frame and modular grill, this piece has been especially designed to protect the suction tubes which feature in high-flow grills. 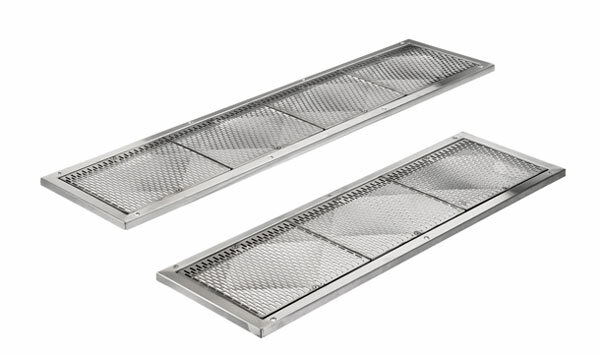 The modular grill system provides the necessary surface are for the centralised suction from one or more water effects and the high flow capacity that these need, as well as concentrating in one single spot all the suction and drainage installations that such effects require. Air pump designed for spas, baths, hydromassage installations and similar which produces a constant stream of air bubbles at medium and high air volume levels. This accessory allows for timed shut off of water effects such as cascades, water jets etc, meaning that they do not have to be permanently connected. General massage effect whilst lying under a stream of alternating bithermal micro-jets. 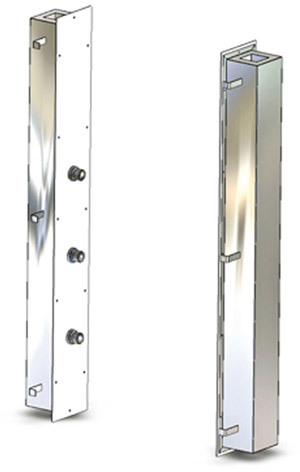 Longitudinal stainless steel structure with 5 directional shower heads featuring anti-block system. Fully collapsible and automatic structure. Programmable push-button electronic micro-processor control. Liquid crystal screen. With a Vichy shower, one can improve massage efficiency and improve bodily hygiene during mud or algae physiotherapeutic treatment. The shower also has an, anti-stress sedative effect as well as combatting rheumatism. Cold fine mist effect throughout the shower cabin, especially designed to alternate and contrast with heat treatment. The unit is comprised of two built in polished stainless steel panels measuring 180x1600x800 mm which face each other. The extractable front pieces measure 1700x900 mm and feature an enamel finish and 32 special fine nozzles. The inner part of these panels houses the internal water distribution circuit and the valves. A push button control is also built in to the system. The bithermal shower features seven hot and cold water points which follow an individually programmed sequence. 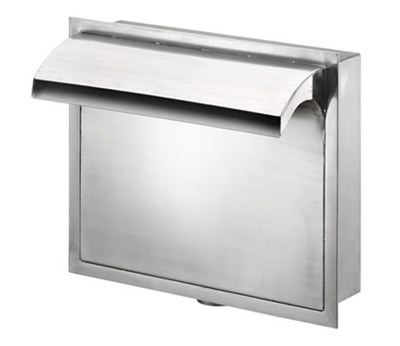 This unit comprises of three polished stainless steel panels. Two panels face each other, with three openings in each where there are six water outlets situated at 30, 60 and 90 cm. from the floor providing a massage to the calves, thighs and hips, with a seventh water outlet housed within a higher opening. The inner part of these panels houses the internal water distribution circuit and the valves. A push button control and thermostat are also built in to the system. Pressure massage for the calves, thighs, hips and lumbar region from both sides of the shower cabin. The unit comprises of two polished stainless steel panels which face each other, on which there are three holes with six water outlets at 30, 60 and 90 cm from floor level. The inner part of these panels houses the internal water distribution circuit and the valves. A push button control and thermostat are also built in to the system. Shower with an enveloping fine cold rain effect. 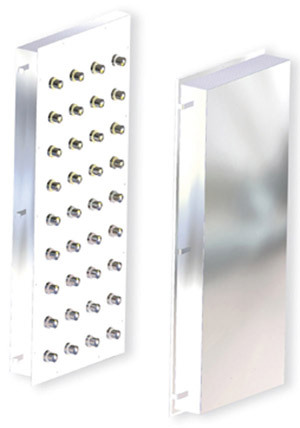 The unit comprises of a polished stainless steel panel with holes in it which is recessed into a false ceiling. The panel’s interior housing contains an internal water circuit and valves. The unit also includes a recessed push button control .